Fulham's relegation worries heightened as they lost at Tottenham to remain two points from Premier League safety. Spurs went ahead when Paulinho tapped in Christian Eriksen's free-kick but Steve Sidwell pounced on an Ezekiel Fryers error to steer in a leveller. 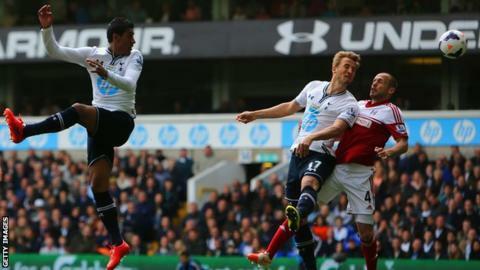 Harry Kane's expertly executed glancing header from Aaron Lennon's cross restored the home side's advantage. Younes Kaboul sidefooted in another Eriksen free-kick to extend the lead before Sidwell had a penalty saved. The visitors were awarded the spot-kick for an Eriksen handball after Hugo Rodallega tried to play the ball past him but, although Sidwell's effort was well-struck, it was too close to keeper Hugo Lloris, who fended the ball away. Defeat ended a two-game winning run for the Cottagers which had revived their survival hopes. They remain two points adrift of 17th-placed Norwich, who play Liverpool on Sunday, with games against Hull, Stoke and Crystal Palace remaining. Tottenham stay sixth and, while they retain a mathematical chance of finishing fourth, their best hope of European football appears to be a Europa League place. The hosts were the better side but having let in three early goals last week at West Brom they were almost caught out again by Fulham. A long John Arne Riise ball forward released Rodallega but the Colombian, with two centre-backs chasing him down, opted for a first-time shot that went well wide. The chance epitomised an urgency being shown by the visitors, although they survived a scare of their own when Kane nodded the ball across for Kaboul to head over from six yards after Fulham failed to clear a corner. Lloris had to rush out of his goal to save a shot by Rodallega before a far-post volley from Aaron Lennon at the other end was touched on to the post by keeper David Stockdale. Tottenham increased the pressure on the visiting goal as the game progressed and were rewarded when Eriksen's pacy and dipping free-kick was tapped in by an unmarked Paulinho. Almost immediately, though, Fulham equalised. Stand-in Spurs centre-back Fryers inadvertently played a one-two with Sidwell, who kept his balance and composure before steering a shot past Lloris. The visitors failed to keep up their level of performance after the break, however, and found themselves behind again when Lennon's cross was glanced in by Kane. Rodallega had a powerful header tipped over the bar by Lloris but Fulham's threat was sporadic at best in the second half. The quality of Tottenham's crosses, in particular from Eriksen, was a constant threat and they again benefited when the Denmark international delivered a dangerous free-kick and Kaboul sidefooted in from close range. Fulham have now conceded 31 goals from set-pieces this season - the most in the Premier League - and their misery was compounded with Sidwell's penalty miss. Corner, Tottenham Hotspur. Conceded by William Kvist. Attempt missed. Fernando Amorebieta (Fulham) header from the centre of the box is close, but misses to the right. Assisted by Ashkan Dejagah with a cross. Attempt missed. Roberto Soldado (Tottenham Hotspur) right footed shot from outside the box is high and wide to the right from a direct free kick. Andros Townsend (Tottenham Hotspur) wins a free kick in the attacking half. Corner, Fulham. Conceded by Younes Kaboul. Ezekiel Fryers (Tottenham Hotspur) wins a free kick in the defensive half. Substitution, Tottenham Hotspur. Andros Townsend replaces Christian Eriksen. Attempt missed. Emmanuel Adebayor (Tottenham Hotspur) right footed shot from outside the box is too high. Assisted by Christian Eriksen. Attempt blocked. Emmanuel Adebayor (Tottenham Hotspur) right footed shot from outside the box is blocked. Assisted by Christian Eriksen. Substitution, Tottenham Hotspur. Roberto Soldado replaces Harry Kane. Penalty saved! Steve Sidwell (Fulham) fails to capitalise on this great opportunity, right footed shot saved in the centre of the goal. Penalty conceded by Christian Eriksen (Tottenham Hotspur) with a hand ball in the penalty area. Offside, Fulham. John Arne Riise tries a through ball, but Ashkan Dejagah is caught offside. Attempt missed. Ashkan Dejagah (Fulham) right footed shot from outside the box is close, but misses to the left. Assisted by Steve Sidwell. Substitution, Tottenham Hotspur. Mousa Dembélé replaces Nacer Chadli. Substitution, Fulham. Elsad Zverotic replaces Johnny Heitinga because of an injury. Offside, Tottenham Hotspur. Ezekiel Fryers tries a through ball, but Harry Kane is caught offside. Goal! Tottenham Hotspur 3, Fulham 1. Younes Kaboul (Tottenham Hotspur) right footed shot from very close range to the bottom right corner. Assisted by Christian Eriksen with a cross following a set piece situation. Johnny Heitinga (Fulham) is shown the yellow card for a bad foul. Foul by Johnny Heitinga (Fulham). Attempt missed. Ezekiel Fryers (Tottenham Hotspur) header from the centre of the box misses to the right. Assisted by Nacer Chadli with a cross following a set piece situation. Substitution, Fulham. Giorgos Karagounis replaces Scott Parker. Corner, Tottenham Hotspur. Conceded by Brede Hangeland. Attempt missed. Brede Hangeland (Fulham) right footed shot from outside the box misses to the right. Assisted by Ashkan Dejagah. Corner, Fulham. Conceded by Hugo Lloris. Attempt saved. Hugo Rodallega (Fulham) header from the centre of the box is saved in the top left corner. Assisted by John Arne Riise with a cross. Goal! Tottenham Hotspur 2, Fulham 1. Harry Kane (Tottenham Hotspur) header from the centre of the box to the bottom left corner. Assisted by Aaron Lennon with a cross.